Escape to Tanderra. 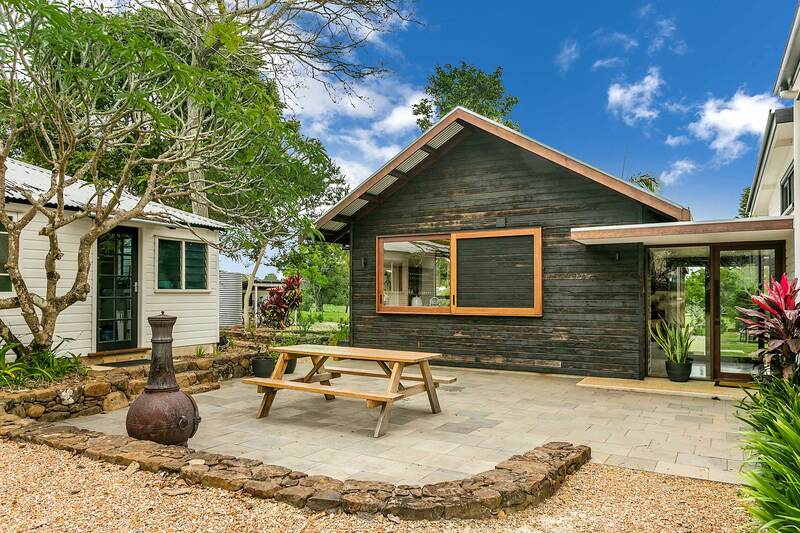 This dreamy rural retreat features 5 bedrooms and 3 bathrooms nestled within tropical foliage and vegetable gardens on a stunning 1-acre property in the beautiful village of Bangalow. 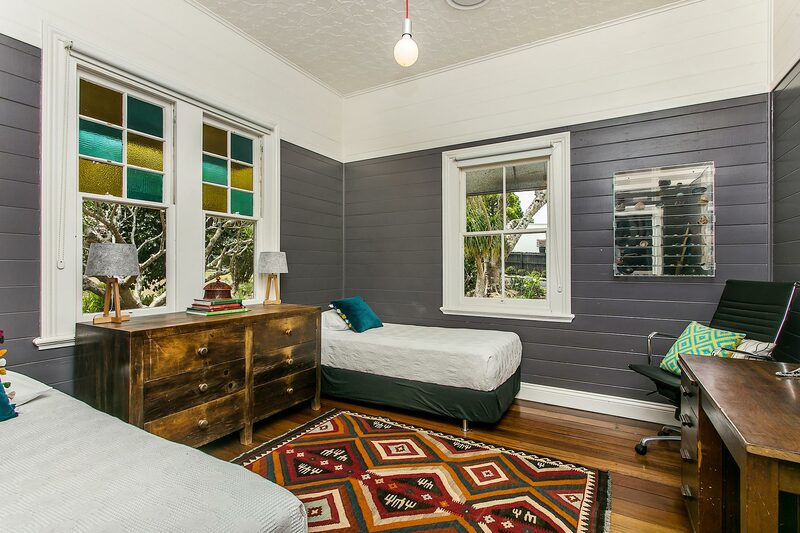 Tanderra promises a perfect mix of modern, contemporary interiors and gorgeous original features including polished hardwood floors, high cathedral ceilings, rustic French doors and stunning stained glass sash windows. 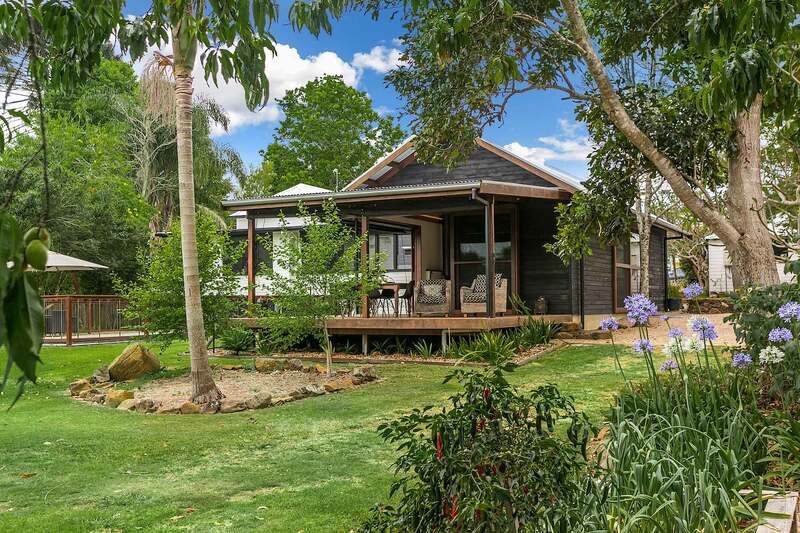 Sleeping up to 12 guests, the main house includes 4 large bedrooms, with an additional separate studio/cottage offering another bedroom and ensuite bathroom. 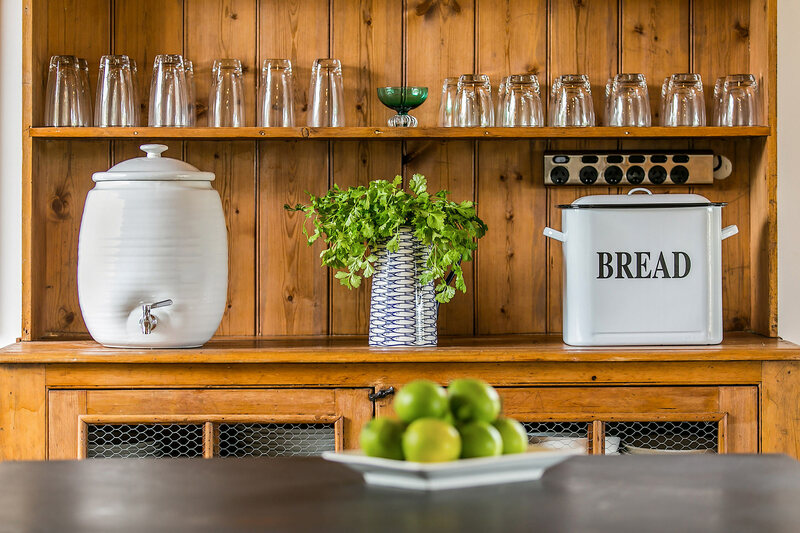 A large open plan living, cooking and dining space showcases high ceilings and country-meets-coasts interiors, with organic styling with reclaimed timber, bright accents and raw fibres. An additional living space/TV room promises indoor relaxation and covered outdoor al fresco dining overlooks the stunning in-ground swimming pool. 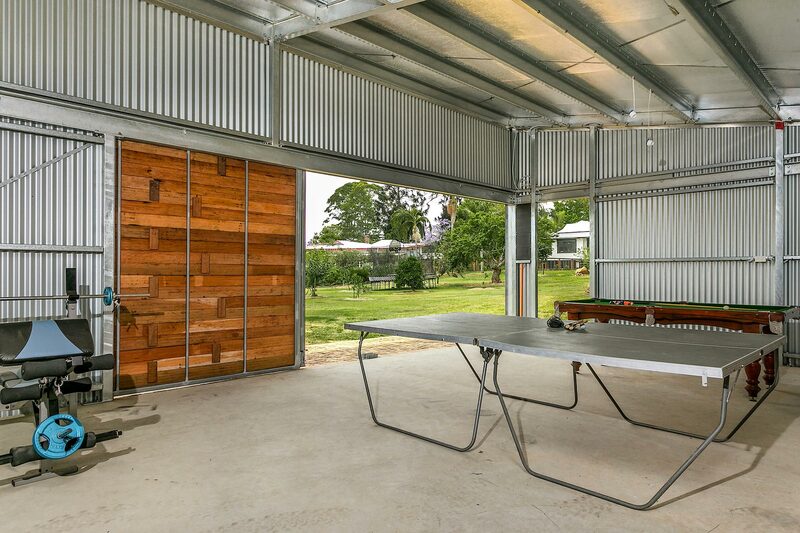 An additional outdoor space sits to the rear of the studio/cottage. 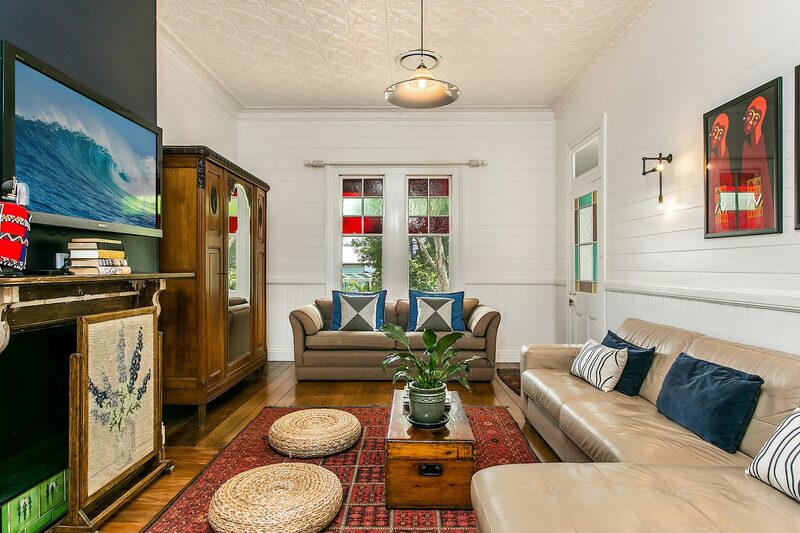 Located only 1km from the charming village of Bangalow, from Tanderra guests can enjoy boutique shopping, local organic coffee and dining, and unique Hinterland arts, craft and culture in a short 5-minute drive. 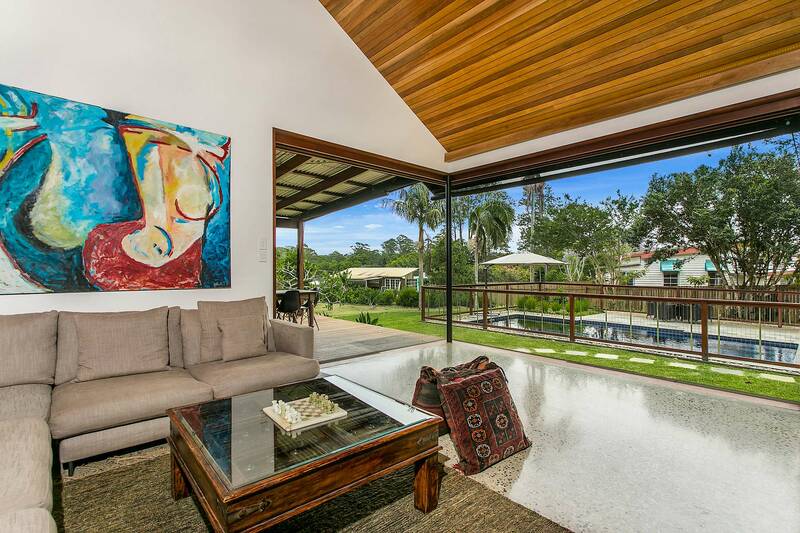 Access Byron Bay town and beaches in a scenic 15-minute drive. Relax in the TV room on leather modular lounges watching the wall mounted flat screen TV within a mix of antique country furniture, modern artwork and a fireplace. 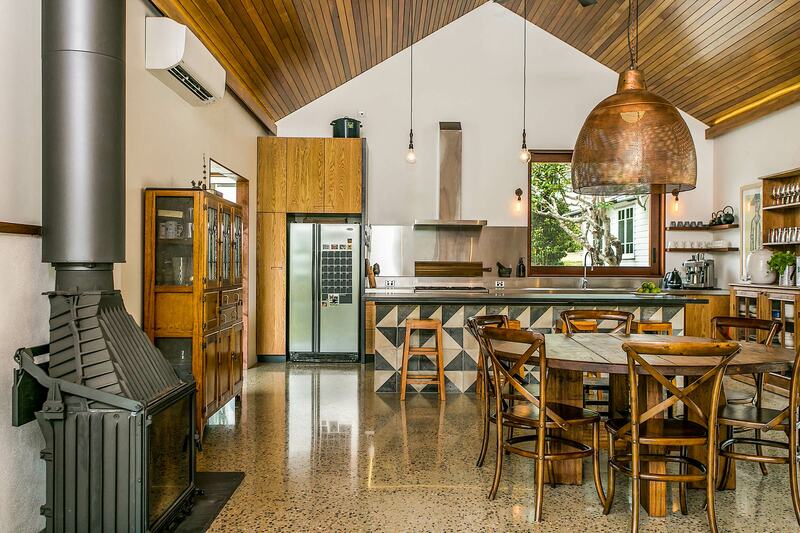 Open plan and airy, the living, cooking and dining space boasts timber cathedral-style sloping ceilings, polished concrete floors and stunning pendant lighting. 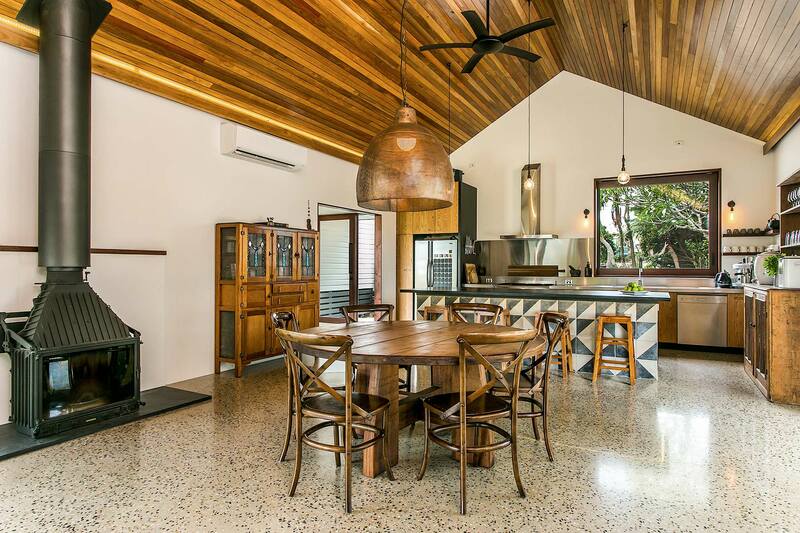 The spacious kitchen features warm timber cabinetry and rustic timber touches mixed with contemporary stainless steel bench-tops, splash-backs and appliances. Views to the garden beyond can be seen through the stunning timber framed awning window. The dining space offers a 6 seat round timber dining setting, as well as 4 seat breakfast bar dining off the kitchen. Relax in elegant style in the living space, which includes a plush corner sofa, rustic timber furniture and natural organic fibres, as well as a timber slow combustion fireplace for ambience and warmth in the cooler months. Wall to wall doors open seamlessly to reveal the covered outdoor entertaining space and stunning in-ground swimming pool. 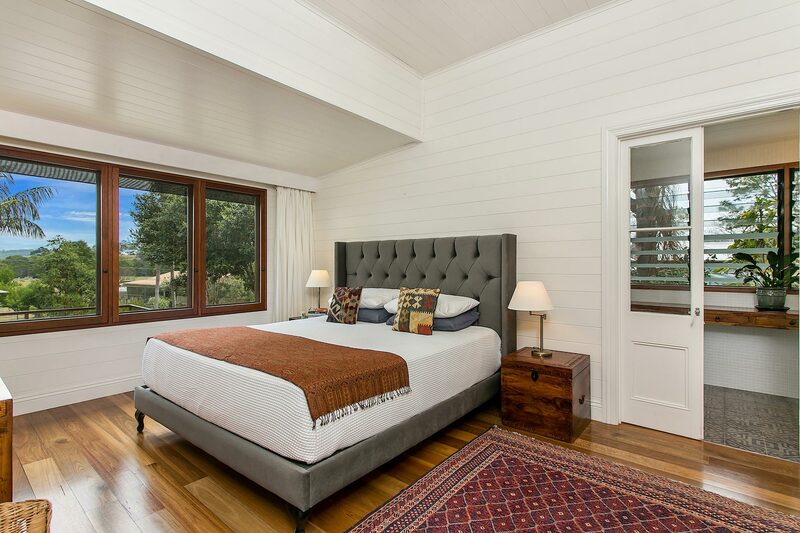 Sleeping is made easy at Tanderra. 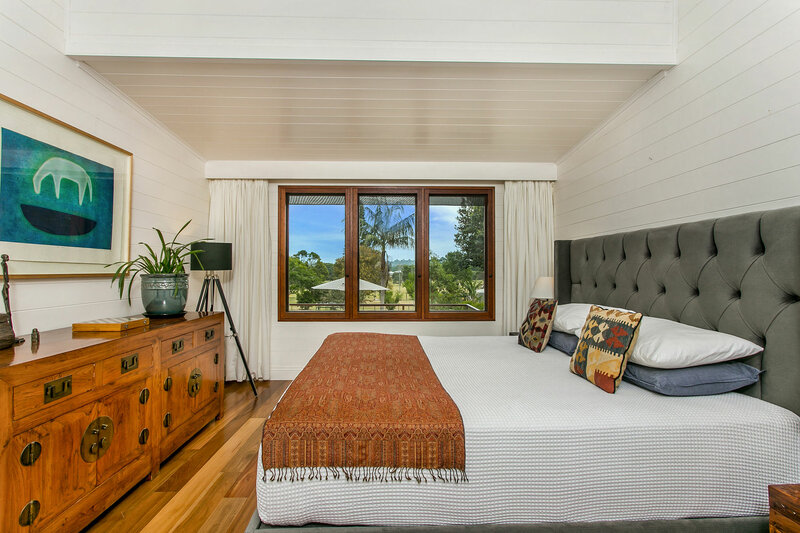 4 bedrooms in the main house all showcase easy coastal-country style, with the master featuring timeless timber framed french doors opening to the ensuite bathroom, and a recessed ceiling showcasing the high ceilings. 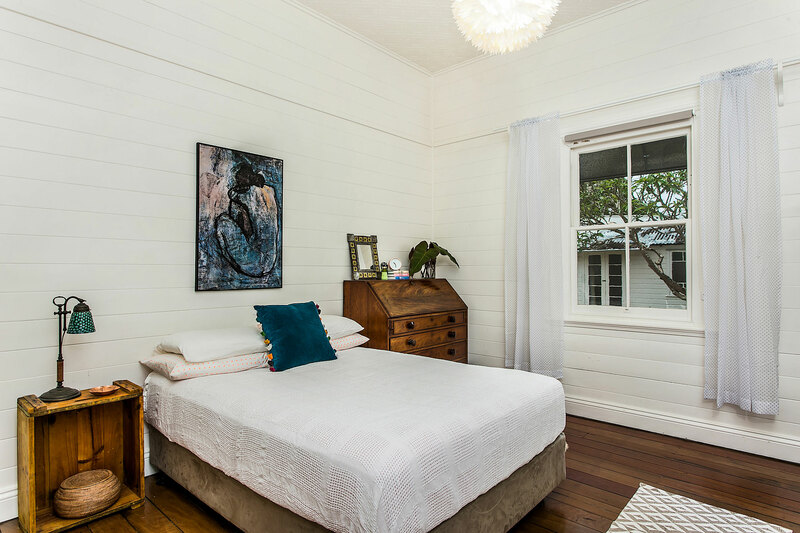 The studio/cottage bedroom boasts a whitewashed timber four post bed with mosquito net canopy, beneath white, bright and airy A-frame ceilings and an ensuite bathroom with original features. Modern and contemporary meet yesteryear, with the bathrooms featuring antique-style timber window framing, ornate timber mirrors and sleek and stylish cabinetry. 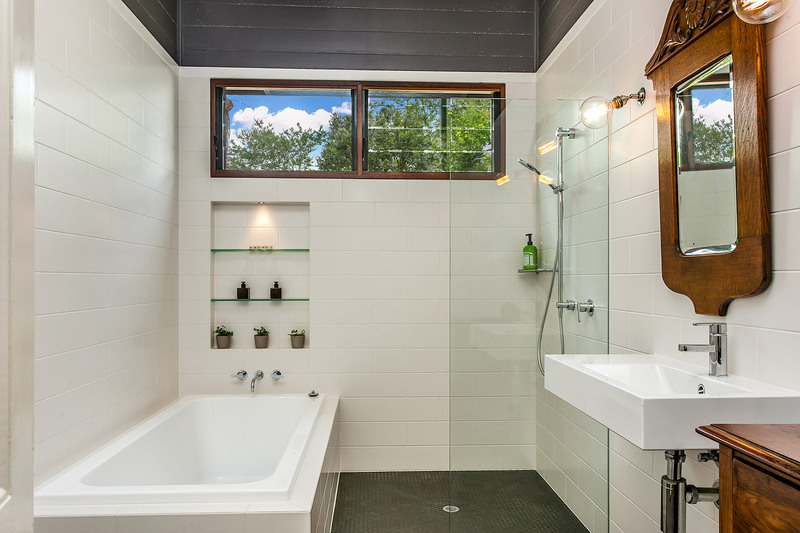 The main bathroom has a built-in bath, frameless glass shower space and floating vanity/basin. 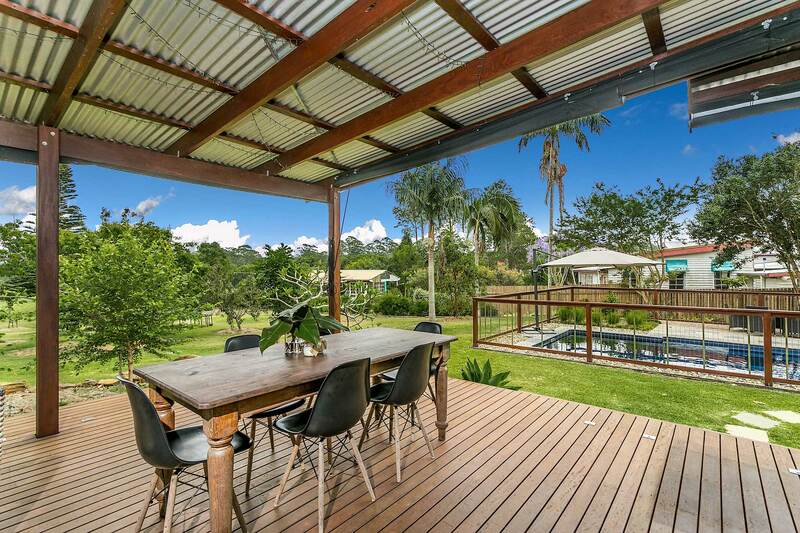 Set on 1 acre of lush, green property, Tanderra’s outdoor space is nothing short of dreamy. 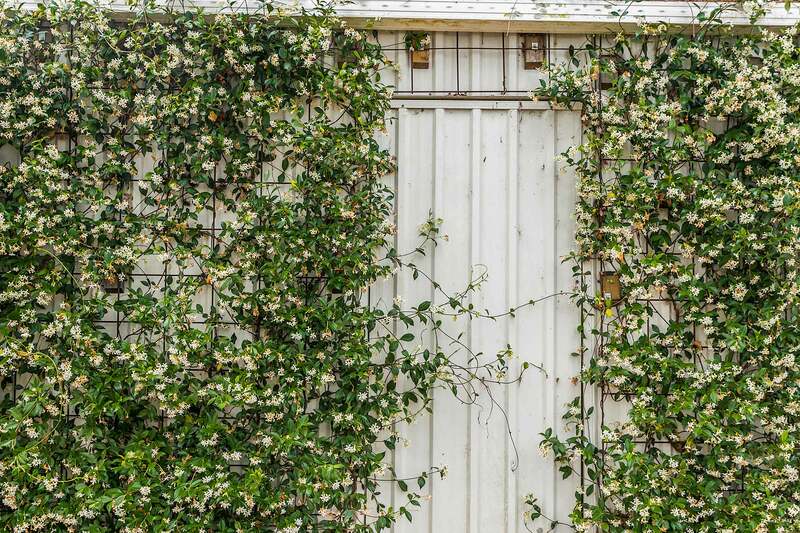 Imagine gorgeous climbing floral vines, garden paths framed by bright blue Agapanthus and a thriving vegetable garden set within rustic planter boxes. A generous covered entertainers deck sits just off the living space in the main house, with BBQ, 6 seat outdoor dining and rattan lounge seating overlooking the stunning pool. 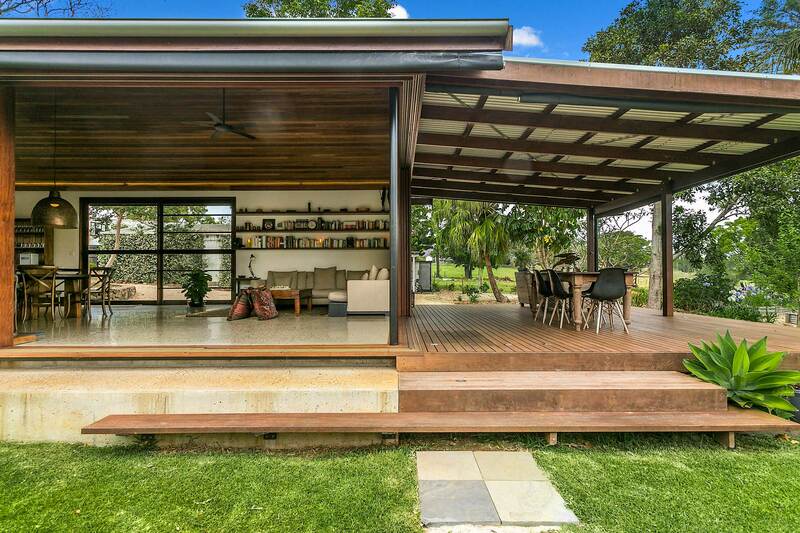 An additional outdoor dining space sits at the rear of the studio space, with large timber picnic table and outdoor fireplace set in the sunny stone courtyard framed by native and tropical trees and gardens. 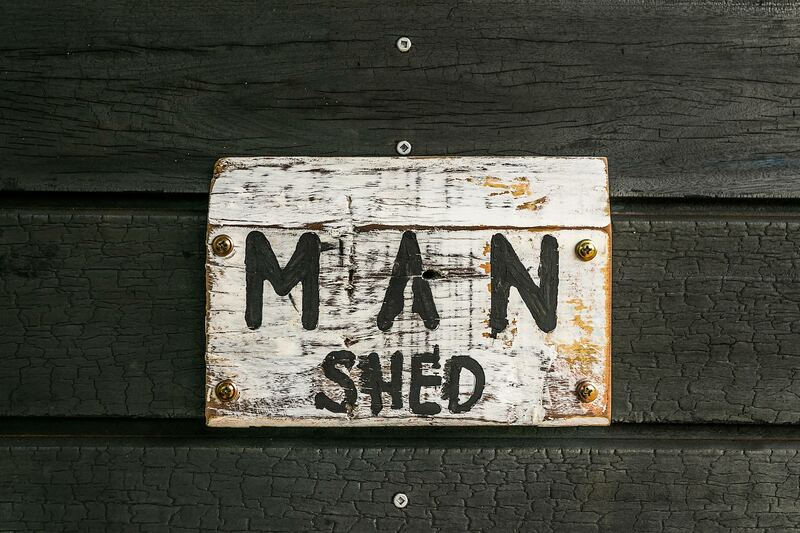 The entertainment continues with a large shed decked out with a pool/billiards table, table tennis and gym equipment. 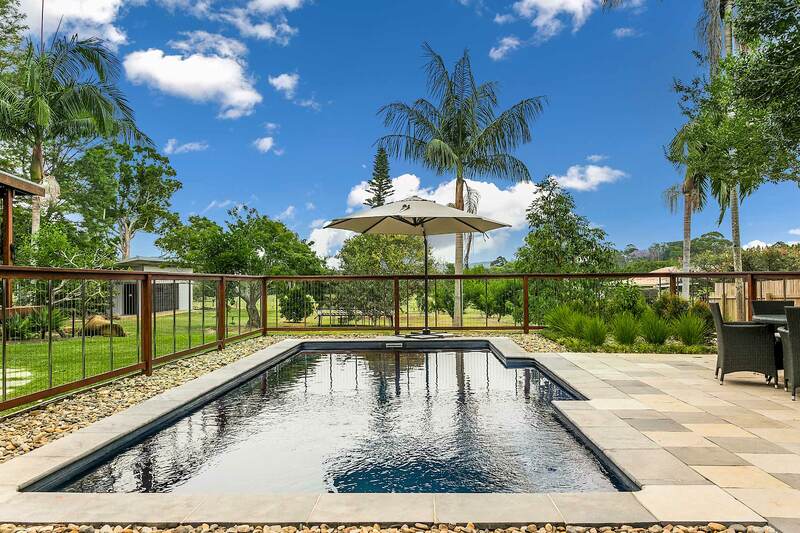 Cool off in the stunning in-ground, fully fenced swimming pool. Swim by the shade of the large cantilever umbrella and sit poolside at the outdoor dining setting. Despite the sanctuary of this rural retreat, guests can still enjoy all the modern conveniences, including a LUXMAN amp located in the living room - plug into your device and enjoy music from wall mounted Bose speakers inside and on the back deck. Guests can also enjoy complimentary WIFI. 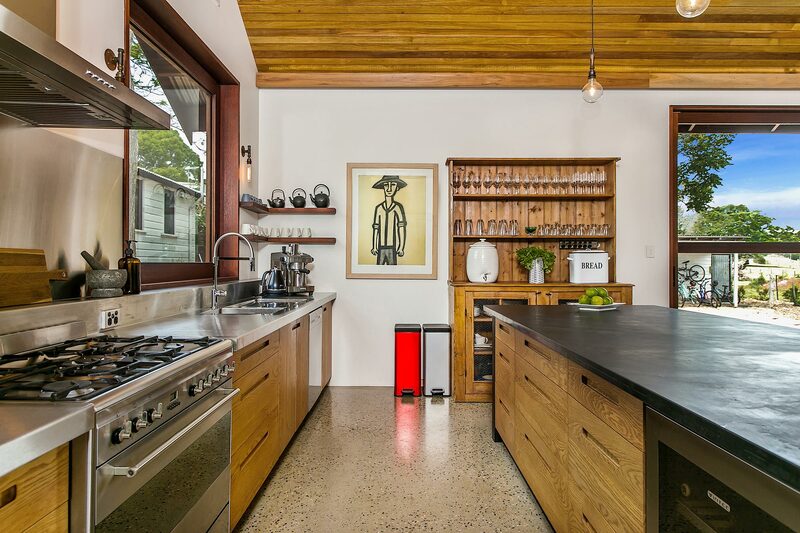 Stay cool and keep warm no matter the season, with reverse cycle air conditioning throughout house and in all bedrooms in main house. Ceiling fans are also included in open plan living, dining and kitchen area and master bedroom. 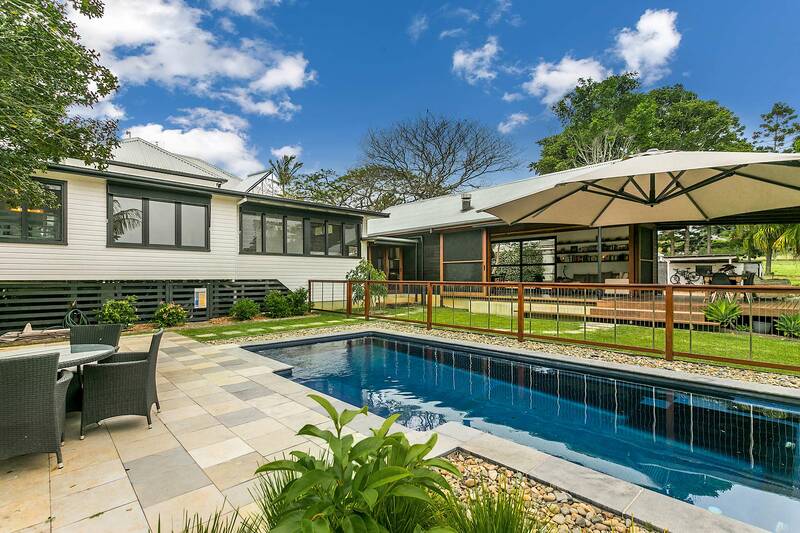 Tanderra enjoys a stunning rural location, only 5 minutes and 1km from the charming Hinterland village of Bangalow, where guests can enjoy boutique shopping, world-class coffee and dining and entertainment galore. 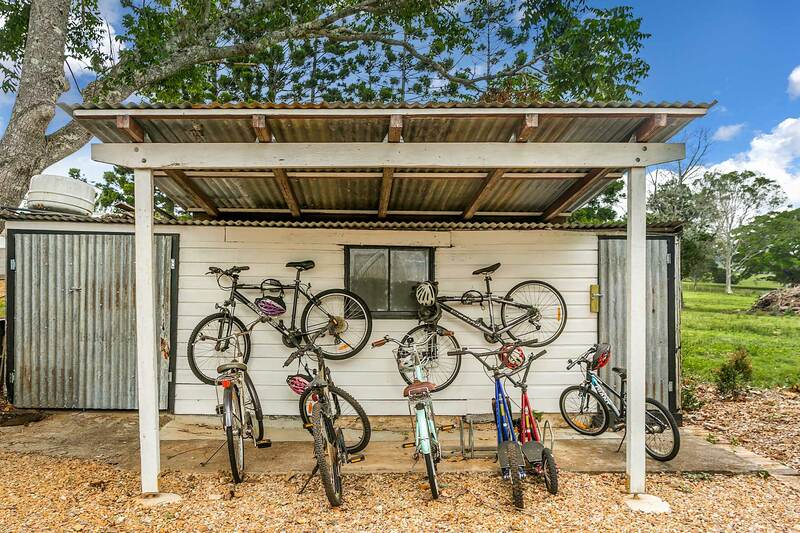 A short 15-minute drive from Tanderra sees guests arrive in Byron Bay with access to the bustling retail, dining and entertainment precinct and the iconic Byron beaches.